Next Chapter . . . Pioneer Menu . . . Search - - - Oldest presented first. Rainier, Oregon was and still is a small town across the Columbia River from Longview, Washington. An early site of Gospel preaching, it is located in Columbia County. By 1857 two preachers, James R. Fisher, accompanied by Lewis Casteel (1813-1867) reached Rainier to find there "a small church organized a little time before by Brother Huntington." School records show that a segment of the Huntington family lived at Rainier in 1857-1858 so their children could attend the local school. 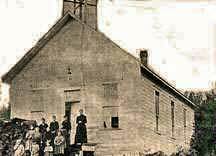 It is reasonable to think the church meetings were in the school house as no record exists of a separate church building in Rainier. The William Huntington family is discussed in more detail in connection with Castle Rock, Washington. William and Eliza Jane Huntington's daughter Annette May was married to budding preacher Jason Fry here in Rainier in 1858. The wedding took place before Justice of the Peace Gilbreth. Fry had come overland in 1849 but did not reach Rainier until 1851. Jason and his brother John intended to log in the area, but found a market for supplying beef to the Oak Point Mill on the Washington side of the Columbia. Jason had a land claim at Coffin Rock, next to the present Trojan Nuclear Plant. However, he and Annette moved to Beaver Valley, about 3.5 miles from the Lewis and Clark Bridge, in 1861. Jason and brother John owned a sawmill there for several years. Eventually, they moved to Grays Harbor County in Washington State where he spent the rest of his life. Fry spent many years preaching in the Johns River area and is buried in Grays Harbor County at the tiny Johns River Cemetery. Johns River Cemetery listing. More about the life of Jason Fry can be gleaned from the book Our People by Edwin Van Syckle and printed by Valley Press, Puyallup, WA. Thomas A. McBride (son of church planter Dr. James McBride) moved here while young to study under Dr. Thomas Condon. In 1866 McBride became a teacher in the district. His brother George also settled at St. Helens. As the old original school building was replaced, the school was named the McBride School, a name that it retains today. St. Helens had several earlier names including Plymouth and New Plymouth. By 1850, the present name was the official name of the post office. Dr. James and Mahala McBride retired here in 1867 and died in 1875 and 1876 respectively. They are buried at St. Helens. Their headstones may be read on this link. There is a profile of Dr. James McBride. Jerry Rushford reports that Dr. McBride established churches in both St. Helens and nearby Scapoose. Two McBride sons and three daughters had moved to St. Helens. In addition to Thomas, George Wycliffe McBride was a merchant. Elvira had married B.D. Butler, Nancy was the wife of W. Holman and Lucinda had married Dr. Charles Green Caples. (Her father was a physician, too.) Lucinda assisted her physician husband as a mid-wife. The U. S. Congress maintains a profile of George Wycliffe McBride. Dr. Caples, listed among the pioneers of 1844, built a home in Columbia City in 1870 and also built part of its furniture. Before becoming a doctor, he had joined the gold rush, saving enough to put himself and his sister through Pacific University. He married Lucinda in 1855. Their house is now on display. His father Joseph and uncle Jacob had founded Columbia City three years earlier. 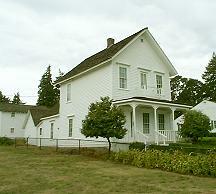 Caples House Museum is located at 1915 1st Street in Columbia City, two miles north of St. Helens. The phone is 503-397-5390. Travelers should call to learn when the museum is open. Stephenie Flora maintains a list of 1844 pioneers and Charles Green Caples is listed among them. The Caples House is featured on ghostweb. For the ghost investigation, click here. As in Rainier, the church probably met in the school house Dr. Caples had established on his property. One account says the second floor was one big room that was used for church services. 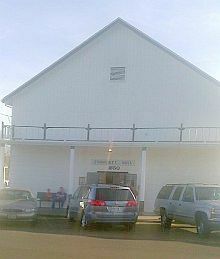 The present Columbia City Community Hall is probably the same buildings. Local people have dated its construction at 1850. Records show preacher Charles Hubbell Hodges leaving Alaska in the fall of 1875 for Columbia City. This preacher from Bethany College became principal of Columbia City Academy for a year. He also preached there and at Scapoose following the death of Dr. James McBride on December 18, 1875. Permit me through the columns of the Messenger to report that I preached twice on Sunday, the 15th inst, and also on the 22nd, at this place to large and attentive congregations. Three very excellent and noble women and one old man of 75 believed with their heart, made confession with their mouth, and were buried by baptism into the likness of Christ's death in the grand and beautiful waters of the Columbia river. I feel impressed that other precious sheaves will yet be garnered. My labors, though not "abundant," were fully equal to my health and strength. There are profiles of Sebastian Adams and L. L. Rowland. Sebastian Adams was married to the late Dr. McBride's daughter Martha and they were probably in town visiting her sisters and brothers. Her mother had died the year before. In 1871, the church reported 16 members. Even with the concentrated labors of the old veteran pioneer preachers, the St. Helens Church did not grow large or survive long. By1881 the congregation reported 41 members and Bruce Wolverton was the circuit-riding preacher, coming every other month on the fourth Sunday. Dr. Swander says the 1883 State Convention noted "the faithfulness of the 'few noble souls' at St. Helens." The present congregations of the Restoration Movement in St. Helens did not develop from this pioneer congregation. The Yearbook of the Disciples for 1888 lists 45 members. It should be noted that Thomas McBride became Chief Justice of the Oregon Supreme Court. George became a State Legislator, Secretary of State, and U.S. Senator from Oregon. Pioneer Reminders: McBride St., McBride School, McBride Creek, and the Caples House Museum in Columbia City. While the Vernonia Christian Church is post-pioneer, it has an interesting beginning. A school teacher, Ethel Ray, had noted the families with a Restoration background as they moved into this logging town. Soon she had located eight families living in or near Vernonia who were members of the Christian Church. They met Sunday afternoons in one home for communion. Later Godliep Schmidt arrived to hold a meeting in the Grange Hall. The church began officially in 1923. The congregation moved first to the High School, then the Rose Theater. On move number six, it occupied its own building. Records show Teddy Leavitt holding a meeting with 119 additions and two led by James Earl Ladd with 102 additions. In the spring of 1996, the entire community experienced a severe flood. Restoration churches from across the country sent money and supplies to aid the flood victims and to restore the church property.